The Brooklyn Youth Chorus and Rinde Eckert in The Aging Magician. Photo by Jill Steinberg. BOTTOM LINE: If you're expecting a children's show or a magic show, you're in for a surprise. This offbeat opera takes a journey into the mind of a tormented writer. Everyone loves a magic show, but Paolo Prestini and Rinde Eckert’s Aging Magician is actually not about magic at all. Instead, it's about the creative life of a fictional magician and the man who’s telling his story. Eckert plays a man writing the tale of the Aging Magician, who upon his old age finds a youth to pass his legacy on to. Once he has done so, the magician finds himself on his deathbed with his special magician’s book—a book of his own devise that holds all his secrets—until it is stolen by a young man the magician sees in his near-death haze...a young man who may or may not be the boy the magician found previously. Eckert’s character is tormented over this story: he’s not eating, he’s not seeing his family, he’s driving his priest crazy with the agony he’s feeling over his creation. And as the Aging Magician hears children’s singing voices as he nears the end of his life, so does the writer. As Aging Magician is not a magic show, it’s not a children’s show either—even though the show is presented at the New Victory Theater (a company known for its wonderful family programming) and it features the Grammy Award-winning Brooklyn Youth Chorus. Rather, the piece is a look into the mind of a lonely artist as he explores the mechanics of creation. I say "mechanics" quite literally; Eckert’s writer character is met with several examples of mechanics in action: the chug-along of the F train, telephone calls from his sister that he avoids. The show is more of a celebration of the contraptions of city life than it is of magic. Between his musings about the Aging Magician, art, and loneliness, Eckert sings with the Brooklyn Youth Chorus and performs a couple of small, amateur magic tricks (a little disappointing given the play's subject). The best part of the show is the Chorus, which sings the complicated music by Prestini and Eckert beautifully, holding the show together (although at times I felt bad for the kids having to sing from this lost, mature perspective). Eckert is a talented vocalist and librettist but I found his monologuing really exhausting. It’s for this reason I have to make the point that this show is not really a children’s show in practice. I honestly wasn’t sure what Eckert was talking about most of the time. Even though he delivers a wonderful performance, from a construction standpoint, if the youth chorus had sung the entire show with the string quartet (featuring Amy Schroeder and Keiko Tokunaga on violin, Nathan Schram on viola, and Andrew Yee on cello) I would have enjoyed that much more. 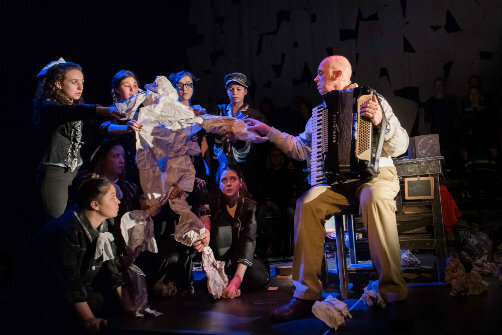 Directed by Julian Crouch, The Aging Magician is a beautiful production, tackling the excitement and mechanics of sound and story. Amy Rubin designed the unique costumes: each member of the chorus had beautifully individual looks that held uniformity in color/style pallet, though Eckert wears something really off-style, which is quite disappointing. And I won’t ruin its purpose, but I have to mention the exquisite sculpture designed by Mark Stewart and Ivan Yelusich, a beautiful art piece as well as a functioning musical instrument. Unfortunately, it was hidden by a backdrop that reminded me of Matilda the Musical for much of the show, which is a shame because the sculpture is nothing short of amazing. Even with its flaws, The Aging Magician is an exciting, offbeat opera. Head to the New Vic for a unique take on the celebration of the mechanics of creativity. The Aging Magician is by Paola Prestini, Rinde Eckert, Julian Crouch. Directed by Julian Crouch. Instrument Design is by Mark Stewart. Video and Lighting design is by Joshua Higgason. Co-Scenic Designer & Costume Designer is Amy Rubin. The cast is Rinde Eckert and the Brooklyn Youth Chorus.